Location: From Kamloops travel west onto the Trans Canada (hwy#1) for 11.4 km. (7.1 miles). Turn south on the Coquihalla hwy (hwy #5). Take exit 336 off of hwy 5 and drive northeast on the Lac le Jeune road for 9.6 km. (6 miles). Turn right to McConnell Lake boat launch. Resorts & Campsites: No resort on the lake, however, there are resorts on the nearby Lac la Jeune and Walloper lakes. There is a camping and picnic area at the boat launch. Fishing Report: A rainbow stocked lake with an abundance of insect and shrimp life offering fair catches of trout up to the 2 lb. range. Trolling and spinning gear are the most popular methods used here while fly fishers concentrate their efforts mainly on the shoal located along the east side of the lake. Viewscape: McConnell Lake was situated in a glacial outwash channel on the Nicola Plateau, part of the Interior Plateau physiographic region. The basin of the lake was likely a depression left by the melting of a dead ice block during deglaciation. Surrounded by gentle rolling hills covered in mainly engelmann spruce, douglas fir, lodgepole pine and occasional alpine fir. Patches of aspen, bunchgrass meadows (with occasional ponderosa pine and sage) are found on the slopes. Willows are found in the low-lying wetlands. Shoreline: The west side has a steep drop-off from the waterline but along the east side and bays the drop-off from the shoreline is very gradual. Most of the shoals are silt with cobbles except for the area immediately around the islands and just off the more acute points which are entirely covered in pebbles. Many areas of shoreline are bushy with a fringe of willows and water birches. 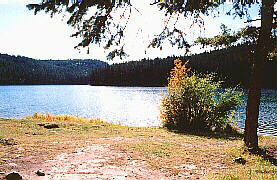 Lodgepole - Lodgepole, a small lake (6.5 ha/16 acres) is located just to the west of McConnell (west off hwy 5). It is a stocked lake which offers a fine rainbow fishery, up to 2 lbs. Elevation is 1433 m. (4700 ft.) so fishing is good through the hot summer months. 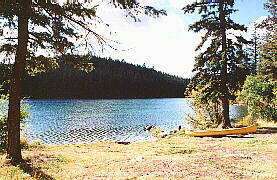 Located on Lodgepole lake is a 10 vehicle BCFS campsite with boat launching (electric motors only).